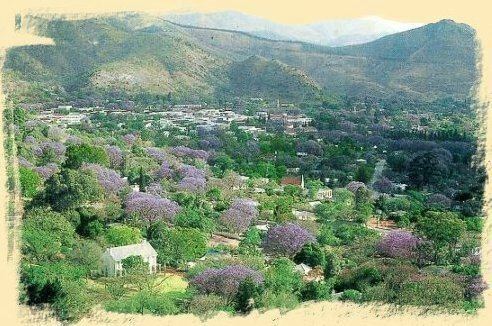 Barberton is a town in the Mpumalanga province of South Africa, which has its origin in the 1880s gold rush in the region. It is situated in the De Kaap Valley and is fringed by the Makhonjwa Mountains. It is 43 kilometres (27 mi) south of Nelspruit and 360 kilometres (220 mi) east of Johannesburg. The mountains around Barberton are amongst the oldest in the world, dating back 3.5 billion years, and these mountains include some of the oldest exposed rocks on the planet. These volcanic rocks, which scientists call the Barberton Greenstone Belt, have given direct evidence of the conditions of life on the surface of the very early earth. In the satellite image, the bare rocks of mountain peaks appear as a pale gray-green, accentuated by the sharp relief of sunlit slopes and their shadows. Deeper shades of green indicate vegetation, including some vegetation on the lower slopes. In the mountain valleys, bright green areas suggest well-watered grassy areas and crops. Deeper green areas are probably forests. The series of bright green circles north of the town of Barberton result from centre-pivot irrigation systems. The area north and west of Barberton appears slightly pale and fuzzy compared to the rest of this image, probably the result of low-lying haze. The first form of life on earth, a bacterial micro fossil Archaeosphaeroides barbertonensis was discovered here in 1967 and has been identified as being 3.1 billion years old. In 1881 gold in the Barberton area was discovered by Tom McLachlan who found alluvial gold at Jamestown. However, due to the location (the hot lowveld region was rife with malaria) no-one wanted to go there until Auguste Roberts ("French Bob") discovered gold in Concession Creek on 20 June 1883. This discovery resulted in a gold rush to the area. On 21 June 1884, Graham Barber wrote a letter to the State Secretary to inform him that he and his two cousins Fred and Harry discovered payable gold on state land where the Umvoti Creek entered the De Kaap valley. The State Secretary then asked the Magistrate in Lydenburg to investigate the matter and for David Wilson, the Gold Commissioner, to submit a report. Wilson investigated on 24 July 1884 and declared the township of Barberton. The town was named after Graham Hoare Barber (1835-1888) who discovered a rich gold-bearing reef there in 1884. Barberton became a municipality in 1904. At first it was just a simple mining camp but grew when Edwin Bray, a prospector discovered gold in the hills above Barberton in 1885 and with 14 partners started the Sheba Reef Gold Mining Company. Large amounts of money flowed into Barberton and the first Stock Exchange to operate in the then Transvaal opened its doors. More buildings were erected, billiard saloons and music halls established. The Criterion and Royal Standard hotels were opened. In 1896, Barberton was connected by rail to the Netherlands-South African Railway Company (NZASM)'s Oosterlijn (Pretoria to Lourenço Marques) through a specifically constructed side line running from Kaapmuiden to Barberton. Barberton flourished for only a brief period and soon the inhabitants began to move away to the newly discovered gold fields on the Reef. Among the owners of mines in the Barberton area are Pan African Resources. On 5 February 2016, 87 miners were rescued after a cave-in at the main entrance of Makonjwaan Gold Mine, operated by Australian-based Vantage Goldfields. Three people were still missing. This reserve is situated in the Barberton Mountain lands and is the Mpumalanga Parks Board's largest reserve, extending over 500 square kilometers. The British built a concentration camp here during the Boer War to house Boer women and children. Sheba mine is today one of the oldest and richest working gold mines in the world, having been in production for more than a century. It is estimated that production will continue for several decades to come. 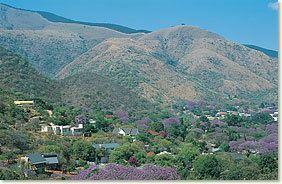 Barberton was home to Sir Percy Fitzpatrick, author of Jock of the Bushveld. A flower, the Barberton Daisy (Gerbera jamesoni) was discovered here in 1889 by Robert Jameson. Barberton (or, at least, a depiction of Barberton) is heavily featured in Bryce Courtenay's novel The Power of One, as the main character's hometown. A character in the Sherlock Holmes adventure "“The Disappearance of Lady Frances Carfax” made his fortune in Barberton. By 1931, the Barberton municipality had assumed a coat of arms. It was registered with the Transvaal Provincial Administration and the Bureau of Heraldry in 1969. The municipality's legal successor, the Umjindi local municipality, now bears the arms. The arms are : Per fess Or, and Vert, in chief a stamp battery Or, and in base three Barberton daisies in fess slipped and leaved proper (i.e. the shield is divided by a horizontal line, the upper half shows a golden stamp battery on a green background and the lower half shows three Barberton daisies on a golden background). The crest is an impala's head, and the motto is Consilio et labore.